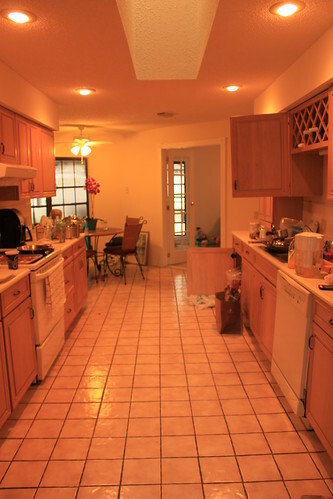 The kitchen was okay when we bought the house. Nothing spectacular, nothing horrible. It looks narrow but is has about six feet of width. 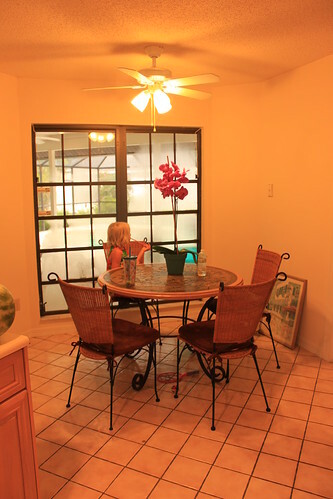 The windows in the dining area look out over the lanai and screened in pool. We found a dinette set on craigslist from Pier One that we liked but it was more than I wanted to spend since the budget for the house was "spend as little as possible". :) I think it was listed for $275. The next day it was listed for $175 and so we bought it. 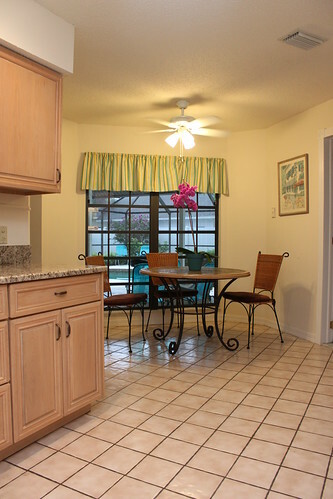 It has heavy metal and wicker chairs and a tiled table top and fits perfectly in our space. We also had to replace the fridge because the one it came with was not in working order. 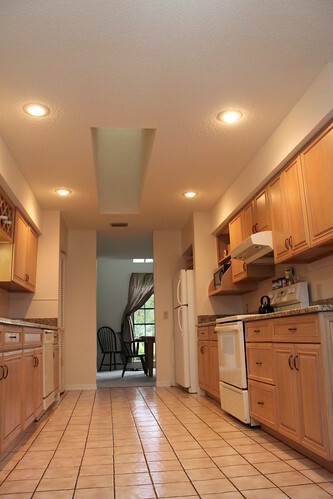 We also replaced the countertops because the old one was chipping and crumbling in spots. 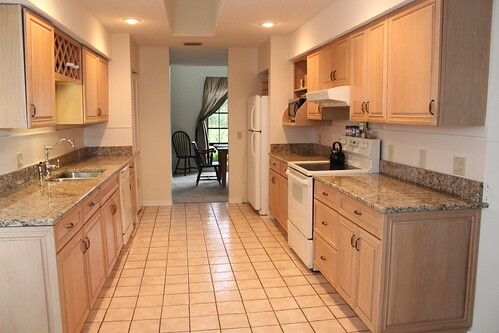 We opted to put in granite, got a great price on it, and it made the whole kitchen look better. We were able to stock most of the kitchen from Goodwill with the exception of dishes (lead-free Corelle from Target), the microwave and highchair (Walmart), and a few pieces from IKEA. I found the curtain at a Goodwill Bargain Barn where you pay for fabric items by weight. I think it put me back .80. From the beginning I had decided that I wanted all of the rooms in the house to flow together and chose teal as the color to tie them all together. The signed watercolor artwork in the kitchen is also a Bargain Barn find and for artwork one pays by the inch. I believe it was $2. It looks great! The granite made such a difference!